It’s that time of year. 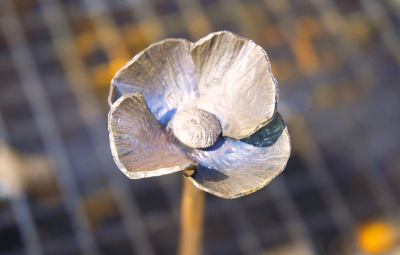 With ANZAC DAY and Remembrance Day in November, now is the perfect excuse to forge a bit of organic artwork. I know a lot of us have been forging the large cenotaph poppies for Belgium. How about downsizing and having a go at these little beauties. I used a 1 1/2lb cross peen hammer, a slightly dulled chisel, 1mm cutting disc, gas torch, 6mm drill, brass brush, a pair of grips and an arc welder. 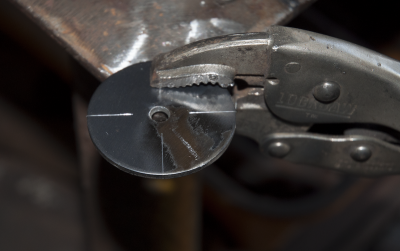 Start with a 50mm diameter disc of 1.6mm thick metal. We have a bag of these at the Penfield forge. Thanks due to Chris Fuller. Center pop the centre of the disc and drill a 6mm diameter hole. Mark out and divide the disc into four quarters and scribe a line from the edge into about 5mm from the edge of the drilled hole. I use a 1mm cutting friction disc, but you can use a hammer and cold chisel if you prefer. Once the disc is split, you need to separate the petals. Bend out the petals as shown. This makes them accessible for thinning, enlarging and texturing. 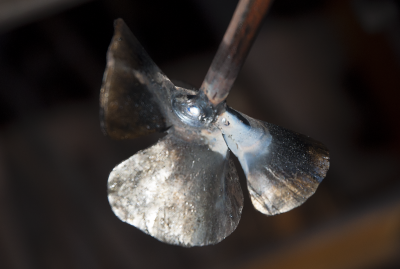 Use some heat if you can to reduce work hardening at the bend. Using a grinder, flap pad or file, radius the sharp corners. 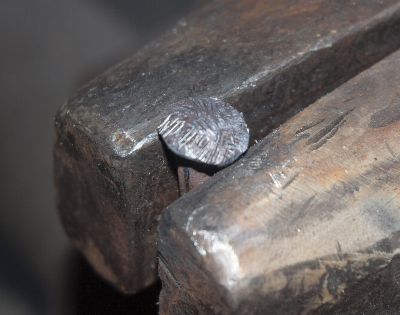 Use a pair of tongs or vice grips and place the face on the corner of your anvil or hardy stake. 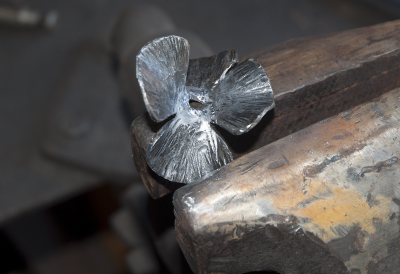 I use a small peen hammer to spread the metal out starting near the hole and working out toward the edge of the petal. 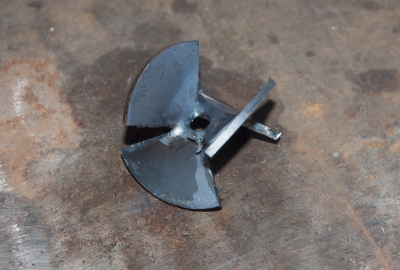 A post vice jaw provides a good spot to do your petal texturing with a cross peen hammer. Work your way around on the top and bottom faces. 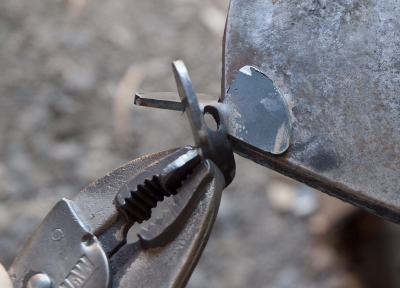 Open the jaws slightly and use your cross peen to forge some curvature into each petal. When you have your petal as you like it, it’s time to make the inner bud and stem. Using 6mm x 300mm of round rod, I clamped the rod in the post vice with 10mm sticking out. Use a gas torch or forge to heat and upset a mushroom shaped head on the round stock. About 10mm diameter should do it. 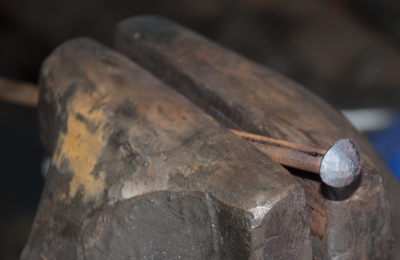 When you have upset to your liking, clamp the stock vertical in the post vice and use a sharp chisel to gently texture a spoke like texture to the bud. Drop the 6mm stock through the hole of the petal, invert and clamp. Get the trusty arc welder out and weld a couple of spots to the rear of the petal/stem. 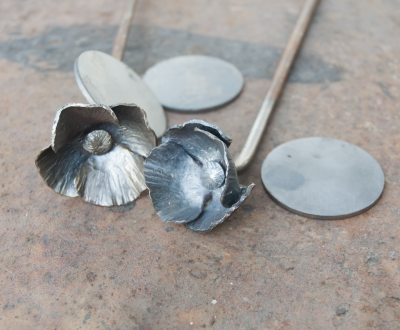 When it is welded up, give the flower a good wire brush and apply a black heat and brass brush. The first one took me 40 minutes and the second one about 25minutes. Good fun and easy on the hammer arm. 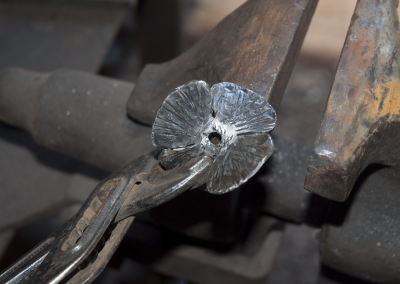 The flower on the left was forged cold with heat applied when initially bending the sections. 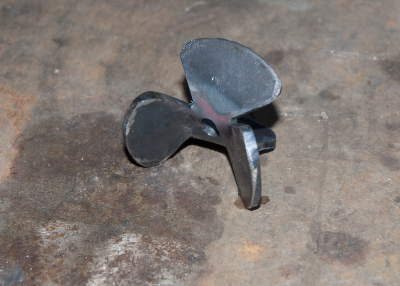 The right side flower was done with heat at all steps of forging. Summer or Winter forging options. If you have an easy method for doing your favourite items, think about making a tutorial and share it with the rest of us. Just take a few shots on the mobile or camera, and a step by step description and send them to myself or Hugh and we’ll post it up in the members section. I hope you’ll all give it a go.